Home » earn money » Get Rich Quick Schemes – Do Any Work? You don’t have to spend long on an affiliate forum before you’ll find someone spamming their latest get rich quick scheme. Sadly, in the minds of the general public, there’s no difference between “get rich quick” and “work from home”. To someone that’s never tried to make a serious income online, becoming an affiliate seems to be a route to instant cash, and as soon as they realise that working from home or running an affiliate site still means working, they move on to the next Ponzi scheme or MLM scam, hoping that this time, they’ll have found the one scheme that really works. · Pyramid schemes – This non-sustainable business model involves the founder recruiting new members, who are then promised payments if they recruit even more members. The first couple of people at the top of the chain do make money, but the longer the chain gets, the harder it is for joiners to see a return on their investment. · Data Entry Work at Home Jobs – These are usually based on a form of pyramid scheme, but are deserving of their own entry because they try to pretend that they’re a legitimate job. Recruits are asked to pay for training, and the training basically teaches them how to recruit people themselves. · Forex Systems – Recruits are asked to pay for training in how to play the Forex market. Of course, investments can go up as well as down, so most people end up out of pocket for the training, and then lose money on the Forex market too. 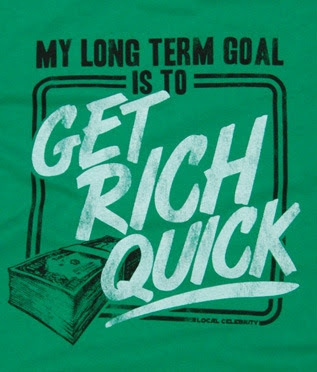 Sadly, there’s no such thing as a get rich quick scheme that works – if any of them did, then everyone would be rich! I suppose you could marry into a rich family, hedge your bets on the lottery, or maybe rob a bank (and then be rich until you went to jail), but the only genuine way to get rich is to work hard. If you want to try to make some extra money online, you could join an affiliate forum and spend a lot of time reading the advice and tips posted there. It is possible to make money online, and if you work hard you can get a stream of semi-passive income. You will need to keep researching new techniques, and manage your website, but once your sites are ticking over, the maintenance workload should be much less than the load from a normal day job, and you can scale that income by replicating the efforts in other niches. It’s not easy, but it can be done. This guest post was submitted by Amy Fowler for Twist Forum, and online affiliate forum. Find out more at twistforum.com or on their Facebook page.